Black Moshannon State Park covers 3,394 acres of forests and wetlands and conserves unique, natural environments. 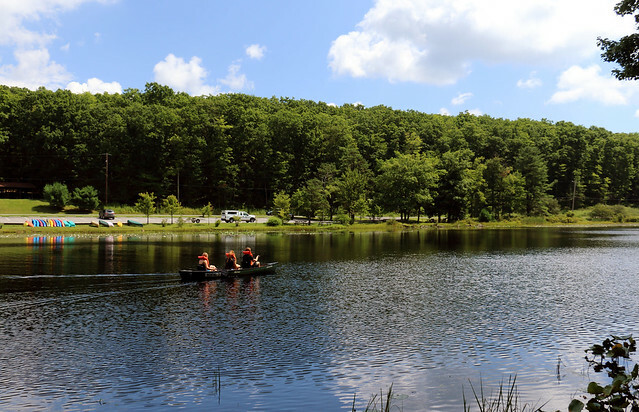 More than 43,000 acres of the Moshannon State Forest surround the park and help create a remote and wild setting that provides recreational opportunities in all seasons. According to local tradition, American Indians called this watershed “Moss-Hanne,” meaning “moose stream,” thus the origin of the park’s name. Appropriately, the “black” in the park name describes the tea-colored waters. The 250-acre Black Moshannon Lake is fed by clear springs and small streams which flow through the bogs that stretch in most directions from its shores. As the clear water flows through sphagnum moss and other wetland plants, it becomes colored by plant tannins. In a sense, the bog vegetation acts like a giant teabag to color the water. The park office is open specific hours. The beach, overnight areas, and other areas are open specific seasons and hours. From Northeast: Take I-80 west to Milesburg Exit 158, then Alt. US 220 south for 6 miles. Turn right onto PA 504 west for 12 miles to the park. From Northwest: Take I-80 east to Kylertown Exit 133. Turn left onto PA 53 for 0.8 mile (through traffic light). At the park sign, turn right onto Winburne Road then 9 miles to the park. From Southeast: Take US 322 west to Exit 68 (Greys Woods/Waddle). On the ramp stay right toward Waddle, then continue 6 miles. Bear right onto the ramp for Alt. US 220 north and then travel for 1 mile. Cars and trucks without trailers can turn left onto Steele Hollow Road. RVs and vehicles towing trailers should proceed an additional 4 miles, then turn left at the park sign in village of Julian to take Beaver Road for 8 miles to the park. From Southwest: From Philipsburg, follow US 322 east. Turn left onto PA 504 and travel 8 miles to the park. From South: Take I-99 north to Exit 61 at Port Matilda. Turn right at end of ramp. In 1/2 mile, turn left at traffic light, then 4 miles on Alt. US 220 (Eagle Valley Road). Cars and trucks without trailers can turn left onto Steele Hollow Road. RVs and vehicles towing trailers should proceed an additional 4 miles, then turn left at the park sign in village of Julian to take Beaver Road for 8 miles to park. This activity or structure is ADA accessible. An ADA accessible boat rental and an ADA accessible park store and a refreshment stand are open seasonally. Families, individuals, schools, and special request groups participate in the park’s environmental interpretive programs. Bog walks and stream studies provide understanding of aquatic ecosystems, wetlands, and human influences. Program schedules are available at the park office. Directions: From the park office, follow Beaver Road 8 miles. Turn right onto US 220 Alternate south, then right onto PA 322 east to Exit 73 to the Mount Nittany Medical Center.